Happy New Year to all of our friends and customers! We at Spectrum wish you all a happy, healthy, and prosperous 2018. Before we get into this amazing catalog and introduce you to The Tower Cellar, I would like to thank all of our valued clients for helping to make 2017 a very busy and successful year. Every day we are grateful that we are able to do what we do for a living. We could not do it without you and for that we are forever thankful. We ended 2017 on a high note with a fantastic Winter Auction and are privileged to open 2018 with a one-of-a-kind auction featuring The Tower Cellar – a historic collection that is undoubtedly well within the highest echelon of the world’s great cellars. Between celebrating the holidays with our families and ringing in the New Year, the Spectrum Wine team spent two weeks in an expansive labyrinth of caves cataloging several thousand bottles of the world’s most sought-after wines. This massive cellar is certainly sui generis – its various cellar rooms stretch across thousands of square feet of perfectly temperature- and humidity-controlled floor space and include two dining rooms for entertaining, and within the cellar rooms rest tens of thousands of the world’s finest wines. Deep underground, the cellar’s size is itself a marvel as are the state-of-the-art temperature- and humidity-control systems (and alarm systems) found in every room in the cellar. Walking through the halls, one’s jaw drops as you peer through windows at the rarities on display. It was a treat, a pleasure, and an honor to be entrusted with the sale of this truly one-of-a-kind collection. A collection like this is truly an extension of the collector – his acquisitions over the years always seemed a little over-the-top and, of course, always had to represent the best of the best. It was amassed by a gentleman with an extreme and certainly outsize passion for fine wine and fine food, and he painstakingly pieced it together bottle by bottle to build, over decades, surely one of the most impressive cellars in the world. At first glance you might be drawn to the vertical of Château Latour dating back to 1863 (and you will notice most of the older components of this vertical came from Château-direct sales, more on which below). The collector was head-over-heels in love with Château Latour and this vertical was his most beloved cellar centerpiece. 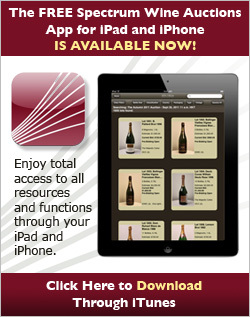 After you finish perusing the Château Latour sections you may notice the bounty of Montrachet from Joseph Drouhin, Bouchard, Sauzet, Fontaine-Gagnard, Lafon, Ramonet, Leflaive, DRC, and more with many offerings in rare magnum formats including from Ramonet, Bouchard, Fontaine-Gagnard, Joseph Drouhin, Remoissenet, and Louis Jadot. But of course no cellar of this magnitude is complete without Petrus, including an imperial (6L) of the beautiful 1995 vintage, bottles of the 2000 and 2003, and much more. But there are also no fewer than 73 Lots of Domaine de la Romanée-Conti; 15 Lots of Le Pin; 23 Lots of Château Lafleur; 34 Lots of Château Margaux; 61 Lots of Château Mouton Rothschild; and so much more (I could go on all day). This auction is an undoubtedly once-in-a-lifetime opportunity to secure an historic assortment of rarities rarely seen in the market. The storage of these wines has been, as described above and as illustrated in these images, beyond reproach. And this collector sourced these extraordinary bottles both from longstanding area retailers as well from major auctions of uniquely outstanding, well-stored, and well-acquired cellars. These include primarily the 2011 sale of The Legendary Collection of Robert Caine (e.g. Ramonet, DRC, Camille Giroud, Guy Amiot, Marc Colin, and more); the 2008 sale of The Collection of Graham Lyons (e.g. Rayas, La Mission Haut-Brion, Latour, d’Yquem, Latour à Pomerol, Gazin, Petrus, Mouton Rothschild, and more); the 2008 sale of The Legendary Cellar of Wolfgang Grünewald (e.g. DRC, Lafon, Marc Colin, Joseph Drouhin, and more); the 2007 sale of The Magnificent Private Cellar of Dr. Nils Stormby (e.g. Petrus, Mouton Rothschild, and more); and the 2006 sale of The Park B. Smith Collection (e.g. Henri Bonneau, Guigal, Janasse, and more). As noted throughout the Château Latour section of the catalog, most of the bottles either were late releases from the Château or otherwise emanate from Château-direct sales. The 1890, 1892, 1896, 1897, 1939, and 1944 are late releases from the Château dated July 2003 that were sold through the auction arm of Château Latour’s parent company later that year in New York in a cellar-direct sale in November, 2003. A series of vintages ranging from 1863 to 1958 emanate from a single-owner collection in France that was rebouchée at the Château and include a note from President Frédéric Engerer confirming the rebouchage. The 1881 was rebouchée at the Château in 1993 and comes from the formidable Collection of Graham Lyons, a lifelong London-based collector (and former barrister). This massive collection will be offered over three auctions with the first being the live sale in Irvine, California on Saturday, February 3, 2018 at the sumptuous Shady Canyon Golf Club. 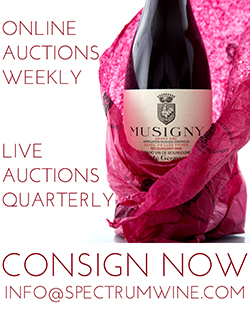 In customary Spectrum Wine Auctions fashion it will be followed up the next week with the close of the internet-only session ending Thursday, February 8, 2018 at 6:00pm PST. Lastly, this magnificent collection deserved (and required) a 3rd auction session which will close the subsequent Thursday, February 15, 2018 at 6:00pm PST. Please enjoy this gorgeous catalog and we do hope to see you in the room at Shady Canyon on February 3rd.